Jorte is a calendar app designed to replace your paper scheduling system. It emphasizes ease of use band replicates the real experience of a day planner. 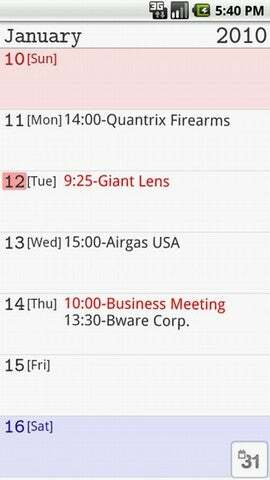 You can operate the scheduling, to-do and calendar functions of the app with one hand. It syncs with Google Calendar and is easy to view on-the-go. The calendar features widgets that allow the user to toggle between a monthly, portrait view and a weekly, landscape view and a list-style weekly view. Unfortunately, this app is a solid disappointment. The app's awkward user interface is greatly complicated by the rough translation of commands and menus from the original Japanese.The weekly/landscape widget doesn't work and the weekly list view only shows the current week. You can create an event by tapping a date on the calendar. This produces a window with the date, a "New Event" button and "Prev/Next" buttons which allow you to move the event date forward or back. The "new event" window has fields for Title, Date, Location, Status (Important or Completed) and Memo. Tap the Menu button to select the Voice Input option which does a decent job picking up words as long as they are spoken clearly. The pop-up windows become rather aggravating the longer you use the app, because they don't disappear after you've finished with an entry. The only way to clear them is to back out manually. 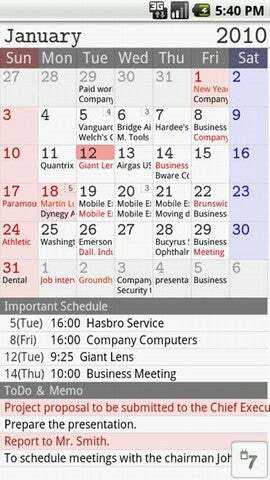 You can choose to color-code your events in either red or blue but there is no option to set up repeat events. The ToDo and Memo list is oriented directly under the calendar. Tapping on the list produces the results in a generic list with important items displayed in red text and completed items in grey. This app is difficult to decipher, oddly organized, and user-unfriendly. It may work wonderfully in its original Japanese but the translated results are poor when applied to English-speaking users.